What's more awesome than grilled chicken? 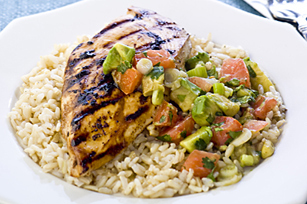 Grilled Chicken with Avocado Salsa. Bonus…it's a HEALTHY LIVING recipe too! Pour 3 Tbsp. dressing over chicken in shallow dish; turn to coat both sides of each breast. Refrigerate 30 min. to marinate. Meanwhile, combine next 5 ingredients; stir in remaining dressing. Heat greased barbecue to medium heat. Remove chicken from marinade; discard marinade. Grill chicken 6 to 8 min. on each side or until done (170ºF). Serve with avocado mixture and rice. For added heat, stir 1-1/2 tsp. hot pepper sauce into avocado mixture before serving with chicken. Help your friends and family eat right with this great-tasting grilled chicken dish that can be part of a healthful eating plan.